In troubled times, sometimes the best thing you can do is open a book and pretend you live somewhere else. In these particular troubled times, I have a feeling almost anywhere else would do—even Mordor. Now feels like a really good time to climb into a long fantasy series and never climb out. But for my own escapist reading last weekend, I chose Marjorie Hillis’s 1936 advice book Live Alone and Like It, pitched as “the classic guide for the single woman” and complete with charming illustrations (peppered throughout this blog post). You’re probably wondering why anyone needs a guide to living alone, let alone liking it, especially if you’ve ever had roommates. It’s true that living alone is a pretty simple matter of paying rent and, you know, living there, but Hillis is here to tell you that living alone can also be a Great Adventure, or at the very least a moderately stylish and entertaining good time. Hillis is fully in favour of making one’s living-by-oneself existence as comfortable and cozy as possible. A writer for Vogue, she was naturally concerned with fashion, style, and parties, but she also, smartly, realized that as more and more women were moving into cities to take jobs and delaying marriage to work and date first, some of them might end up living on their own, and those women would also want to be fashionable, stylish, and throw parties. Live Alone and Like It is aimed at women who hope to eventually not live alone—e.g., women who hope to marry. It was such a bestseller that women who lived alone briefly became known as “liver-alones,” and Hillis went on to write another advice book, Orchids on Your Budget. about real women who do or do not follow her advice. Consider “Miss N., a pink and plump lady” who scares off men because she has “the gleam of the huntress” in her eyes, versus Mrs. de W, a widow who learns that breakfast in bed is the cure after a lifetime of working hard. Let’s all put on our favourite bed-jackets, let in some morning sun, and eat some toast in bed while we read a novel. This book is really quite delightful, and it doesn’t even feel that dated. There is an arch comment about Calvin Coolidge, which isn’t exactly topical, but it’s a sick burn, so that’s a wash. 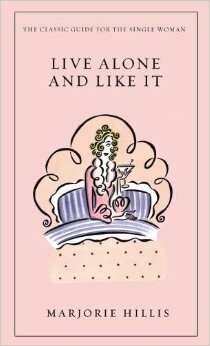 In the past few years, there have been a whole host of books about women living alone and spinsterhood and people delaying marriage (I’ve even written about some of them), and Live Alone and Like It fits right in, especially with its focus on what to buy to achieve the perfect single life. Consumerism and spinsterhood seem to go hand in hand, but that’s an essay for another blog post. Allow me to quote from the book now to convince you that it’s a singularly pleasurable reading experience. And with chapter titles like “Solitary Refinement” and “A Lady and Her Liquor,” how could it not be? On hobbies: “The hobbies your friends will appreciate most are astrology, numerology, palmistry, reading hand-writing, and fortune telling by cards (or anything else).” It’s the parenthetical “anything else” that I love there. Even fortune telling by reading animal entrails?! I’ve been thinking a lot about the why of living alone lately. My landlords sold the house I live in, and for a while I thought I should move out and find roommates so I could pay less rent. But I keep coming back to the same thought, that living alone is truly worth it. There’s a special kind of magic in being able to sit on my (newly covered! )* couch on a Saturday morning, reading or waiting for banana bread to bake or checking the morning headlines, and looking up to see my card catalogue and my old butter churn and all my art and books and unnecessary throw blankets, and knowing that absolutely no one is going to bother me or tell me I have too many blankets, because I live alone and like it. As Hillis writes, “The trick is to arrange your life so that you really do like it.” Helpful advice for all of us, liver-alone or not.